The RAM 2500 with CNG power has a huge bed, but that’s mostly filled with a huge steel container to house the large CNG tanks. There are big trucks and Monster trucks, no not those with the giant wheels that crush cars in arenas around the Midwest all winter, but Really Big trucks, like the RAM heavy-duty beast I just drove.I’ve been on the commercial test truck list for Chrysler Corp. of late. So this week I ran the RAM 2500 SLT Crew Cab 4X4, with the CNG option. That’s a long name for a giant truck, but the key differentiator is that it runs on both gasoline and compressed natural gas (CNG). To be honest, no one who isn’t into the construction trades or farming is likely going to even consider this monster. RAM says it only offers the truck to fleet and commercial buyers. But here’s the lowdown on it, in case you fall into one of those categories. 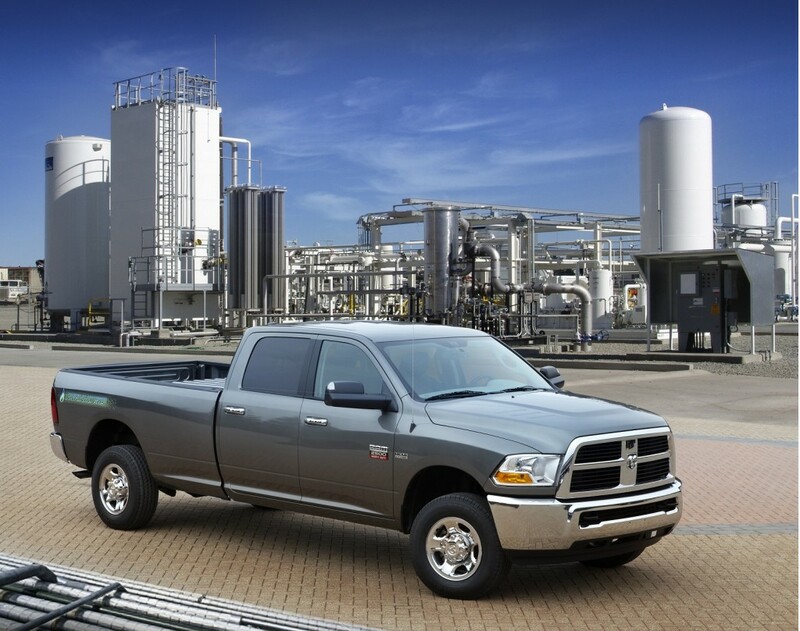 The RAM, formerly known as Dodge, is the normal three-quarter ton heavy-duty crew cab model with a long (8-foot) bed. It needs the long bed because it hauls along two large CNG tanks (130-liters each and equivalent to 18.2 gallons of gasoline) under a steel cover in the bed, just behind the cab. You can fill the tanks via an outlet in the normal fuel filler area, or fill its 35-gallon gas tank in the same spot. Here’s the rub, for now. There are precious few CNG filler stations available to the public, just about 520 nationally. In southeast Wisconsin there are a handful, mostly WE Energy sites and one station in West Bend. Not all are open all the time, so if you have such a vehicle you’ll need to call ahead to find out fuel availability. That’s why it’s handy to have the gas tank. Sadly, the test truck managed only about 10 mpg on gasoline and the CNG gauge said it ran out after just a day or so. Yet when it was refilled, it apparently still was nearly full. Not sure why that happened. But the truck’s 5.7-liter Hemi V8 is supposed to start on gasoline and then switch to CNG once everything is up to the proper temperature. The first two days I had it, the two lights on the dash that tell you which mode you’re in would switch between CNG and gas. After that, and with the CNG gauge on E, it ran strictly on gas. The RAM Crew Cab starts at $40,745, but the CNG option adds $11,000. Other goodies pushed this to $57,745. Now you’d think it would be tough to justify the extra expense. Except that CNG is roughly $2 a gallon. So if you have it readily available you can save big fuel bucks. In a work truck that most companies would keep at least 5 years to depreciate for tax purposes, the savings add up and can make sense. 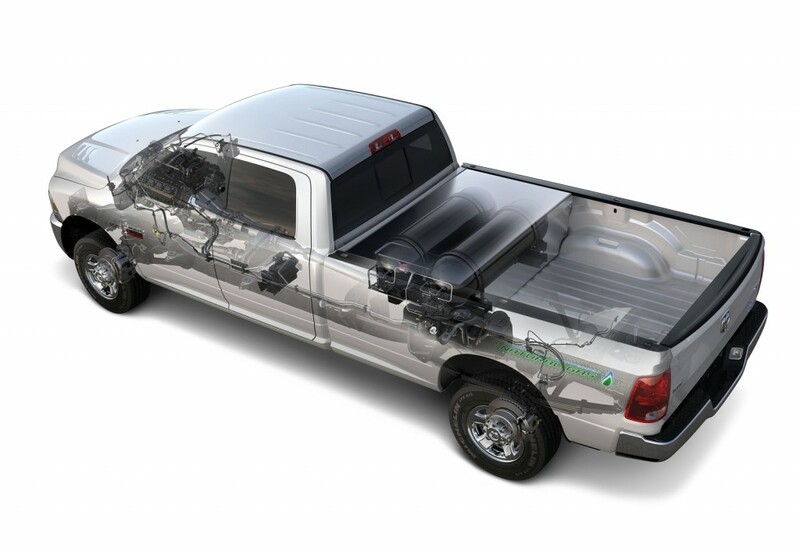 This cutaway shows the Ram’s engine and CNG fuel system, complete with tanks behind the Crew Cab, in the bed. A few other notes on the CNG: first, it’s suggested you use a 3,600 psi system to fuel the truck. You can use a less pressurized system, but it’ll take longer to fill the big tanks, and filling with CNG already is slower than with gasoline. 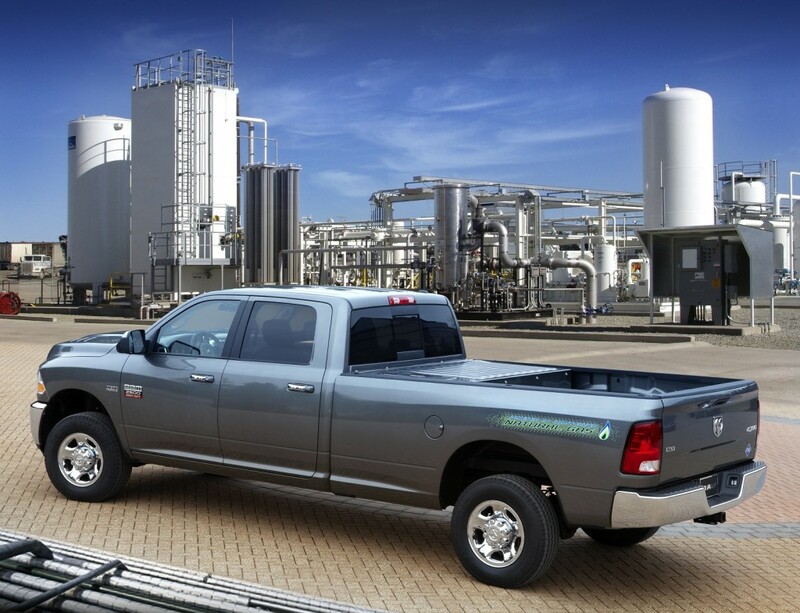 Also, RAM says you’ll get 255 miles on these CNG tanks, and up to 367 miles running on both gas and CNG and with the truck’s standard 8-gallon gas tank. This one added a 35-gallon tank for $350. Naturally that adds more weight for the 27 extra gallons of petrol.Power is also about 15% less on CNG than gasoline, so you can haul a 1,580 lb. payload or tow 7,650 lbs. Compare that with 2,360 lb. payload and 14,550 lbs. of towing power using gasoline. There is little, if any, difference in the truck’s feel between CNG and gas power and outside of the CNG system and tanks adding 780 lbs. to the truck, this is pretty much a standard RAM HD pickup. and takes a while to get up to highway speeds. Just a few other practical matters to mention; including the giant step-up height of the truck, which is obviously aimed at work site duty. Most of us will need a running board or step to get aboard. My hip is still aching from the giant stretch it took to crawl into this. Thank goodness for the A-pillar handle and steering wheel that I used to pull myself up to the cab. RAM creates a comfortable interior, the silver test truck (yes, with some CNG decals on the outer bed walls), adding $900 worth of premium cloth with power adjustments for the driver. This also includes a bench seat that features RAM’s big fold-down armrest and storage box in the middle. That’s great for holding a laptop or tablet and a ton of paperwork, clip boards, etc. The truck has a tiny touch screen for the radio and nav system. It looked out of place in such a macho large machine. And I reiterate that touch screens do not always work well as you often must touch them several times to get the proper reaction. Hey, we ARE bouncing around in vehicles, so touching a tiny distinct spot on a screen is not always so simple. This one includes the Uconnect system with satellite radio, CD, MP3, Bluetooth and navigation. Chrysler says this is a 6.5-inch screen, but it looks smaller. Oh, and all this costs you $1,200. … AND there’s a $495 charge to upgrade to an Alpine premium audio system with subwoofer and rear park assist. I like the rear backup camera, but that adds $200 too. There is plenty of room inside the Crew Cab for five adults and one smaller person in the middle up front, if need be. I also like the large climate control knobs and a heavy-duty fan that quickly distributes the heat. Not for everyone, this CNG option, but if you’re a commercial user and have your own CNG filling station, or easy access to one, it could help keep your fuel budget under control as we accelerate back up to $4 a gallon gas. By the way, a gas-only powered 2500 ST Crew Cab 4×4 lists at about $36,000. Hits: Big brawny HD truck, room for 6 inside, strong for towing. Bench front seat include a huge fold-down storage/arm rest, big climate control knobs and strong heater fan. CNG option makes this cleaner, more economical to run. Misses: CNG hard to find and fill, plus costs $11 grand extra and truck gets horrible gas mileage otherwise. Monster step up to get in, needs running board, and this is so heavy it takes some time to get up to speed. Small touch screen looks oddly small in big truck. truly loved that post, great stuff!